Fleas in the home or on your pet can be a living nightmare. These parasites are uniquely designed to evade detection, hiding among your pet’s fur, or in the depths of your carpet. The first sign you will notice will often be an itchy bite or an unhappy pet. By this stage, the dreaded fleas have already made themselves comfortable. No matter what, you will have to work hard to completely eradicate these pests from your abode. But you may also be wondering just how long these uninvited bloodsuckers can live. In this article, we take a close look at the lifespan of a flea, and the factors which can influence it. How Long Do Fleas Live on Average? What Factors Can Affect the Lifespan of a Flea? Fleas must go through four lifecycle stages - egg, larvae, pupae and adult. The time spent in each stage depends upon the environmental conditions. Initially laid on the host, flea eggs that fall are unlikely to survive. Those which are deposited in cool and humid places stand the best chance at development. The most common place for flea eggs to accumulate in the home is on carpet fibers. Flea larvae will hatch from the egg between two and 12 days after they have been laid. They have worm-like bodies, appearing nothing like an adult flea at this stage. Flea larvae remain in the area they have hatched. In warmer temperatures, flea larvae may remain in this stage for as little as four days, up to around 24 days. During cold winter months, flea larvae may delay their development by up to 200 days. Once the larvae have matured, they will start looking for a suitable place to spin their cocoon and enter the pupae stage. Just like the other stages, the length of time they will remain in this stage varies according to outside conditions. 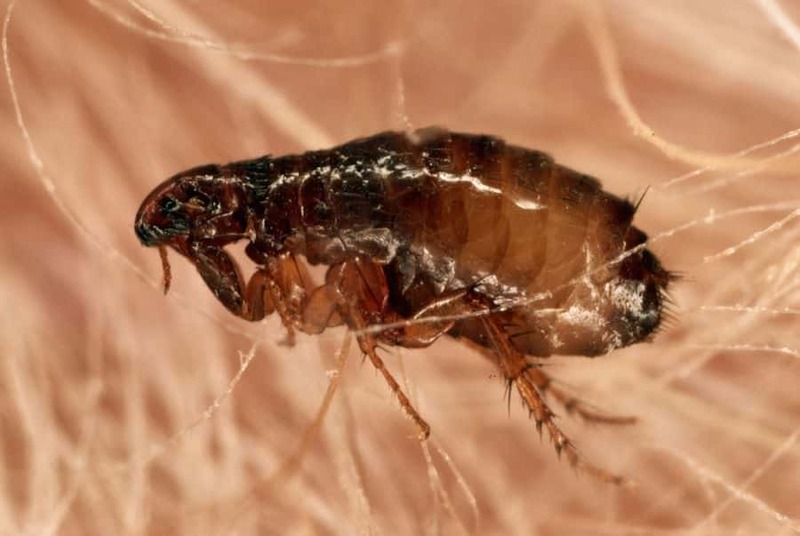 Most often, adult fleas will emerge from the cocoon after 5–14 days. Once they have emerged, adult fleas need to feed as soon as they can. If they are unable to find a suitable host to latch onto, they will usually die of starvation within a week. However, if they are lucky enough to find a host, adult fleas can live as long as three months if they are undisturbed and have constant access to blood meals. Fleas are resilient parasites, which have evolved over the millennia alongside their preferred hosts. As we have seen, fleas are capable of surviving for relatively long periods without access to blood meals during their development. They can also adjust the rate of their development according to the surrounding environment. Fleas become markedly more vulnerable to starvation once they have begun to regularly feed, and breed, on their host. This is due to metabolic changes which are triggered by regular blood feeds and egg production. Fleas which have just emerged from their pupal cocoon are referred to as ‘unfed adults’. In generally humid environments, these fleas are capable of surviving without food for up to 15 days. However, once these unfed adults start to feed regularly, their biology changes and they become ‘blood-dependent’. For example, one study found that if a newly emerged flea was allowed to feed on a host for five days and was then removed, it starved to death within only four days. Breeding females are even more dependent upon frequent blood feeds. Once they begin to produce eggs, their metabolic rate increases and they use more energy. If a breeding female is removed from her host, she will usually die within 24 hours. As we touched upon earlier in this article, fleas are rather sensitive to temperatures and relative humidity. Adult fleas will perish at temperatures below freezing. At 30.2 Fahrenheit, all adult fleas will be dead within five days. Within the first 24 hours, 20 percent of adult fleas, and more than 70 percent of those still in their cocoons will also be dead. At temperatures slightly higher, life expectancy increases. Adult fleas are able to endure 10 days at a temperature of 37.4 Fahrenheit before succumbing. Conversely, fleas cannot survive for more than two days at temperatures of more than 95 Fahrenheit, if the humidity is below 75 percent. Should relative humidity be above this level, they may survive as long as 10 days. Once fleas have started to feed regularly on a host, the availability of blood is key to their lifespan. Should a flea become dislodged from their host, they will not survive for very long without food. In some cases, fleas will bite and feed upon unsuitable hosts, such as humans, out of desperation for a meal. Fleas will struggle to reproduce unless they are feeding on the blood of their preferred host. For example, human blood is not nutritious enough to support flea fertility in the same way as cat blood. Becoming exposed to insecticides will dramatically affect the lifespan of a flea. Insect growth regulators are chemicals which interfere with the proper growth and development of fleas. These products work by mimicking hormones which are naturally present in fleas. After coming into contact with insect growth regulators, flea eggs, larvae and pupae will fail to reach maturity. As we have seen, the length of time a flea may live is not a simple question to answer. Much depends upon the environmental conditions the flea finds itself in. Ambient temperature, relative humidity, and availability of suitable hosts all play a role in survivability. Often, fleas may try to improve their chances of survival by delaying their development in environments which are unlikely to support them. If the conditions are right, and they can freely feed, the longest a flea can live is usually around three months. Hopefully, you will be able to eradicate them from your home long before that.